Per his military service record (Depot), Patrick Willis was born at Yass, N.S.W. He gave his age as 34 years, his marital status as single, and his occupation as shearer. His description on his Certificate of Medical Examination was height 5 feet 4 inches tall, weight 144 lbs., with a medium complexion, grey eyes, and brown hair. His religious denomination was recorded as Roman Catholic. He claimed that he had no previous military service. He listed his mother, Mrs Catherine Willis, Sorrell Street, Parramatta North, as his next of kin on his Attestation Paper. The Wellington Times reported ‘Willis’ as one of the 8 named men who offered themselves as recruits to join the Coo-ee March at the recruiting meeting held at the Wongarbon Hall on 14th October 1915. ‘P. Willis’ was listed as one of the Wongarbon boys with the Coo-ees in The Dubbo Liberal and Macquarie Advocate. He completed his medical examination on 16th October 1915 at Wellington (the day the Coo-ees arrived at Wellington), and was attested by Captain Nicholas at Dripstone on the 19th October 1915. On 7th February 1916 Private Willis was charged with being absent without leave from 27th January 1916 to 6th February 1916. He was fined 50 shillings. On 24th February 1916 Private Willis was charged with being absent without leave from 18th February 1916 till 23rd February 1916. He was recommended to be discharged. Private Willis was discharged services no longer required on 25th February 1916. Per his military service record (Depot), Loring Ashhurst stated on his Attestation Paper that he was born at Montreal, Canada. (He stated on his naturalization application papers dated August 1916 that he was born in Charleston, South Carolina, in the United States of America). He gave his age as 39 years and 9 months, his marital status as single (although it appears he was married), and his occupation as miner. His description on his certificate of medical examination was height 5 feet 7 inches tall, weight 160 lbs., with a dark complexion, brown eyes, and dark hair. His religious denomination was recorded as Church of England. He claimed that he had no previous military service. He listed Alice Ashhurst, Linsley Street, Cobar, N.S.W., as his next of kin on his Attestation Paper. He listed his postal address as ‘Cobar, N.S.W.’ on his initial Application to Enlist in the Australian Imperial Force form. The Wellington Times reported ‘Askhurst’ as one of the 8 named men who offered themselves at the recruiting meeting held at Wongarbon. His surname is spelt differently in several newspaper articles. He completed his medical examination on the 16th October 1915 at Wellington (the day the Coo-ees arrived at Wellington), and was attested by Captain Nicholas at Dripstone on the 18th October 1915. A Medical History form in his service record shows he was admitted to Orange District Hospital during his time in the Coo-ee March from 23rd October 1915 to 25th October 1915 (while the Coo-ees were at Orange), with ‘congestion base right lung’, induced by ‘exposure to wet’. Loring Asshurst appears to have been one of the 5 men reported in The Bathurst Times to have been admitted to Orange Hospital ‘suffering from influenza’ following a ‘drenching ‘. It had poured rain on the Coo-ees the morning they left Molong, on their way to Orange, on 23rd October 1915. After completing the Coo-ee March he went to Liverpool Camp to the Infantry Depot. ‘Askhurst’ was included in a list of ‘Wellingtonians at the front’ in the Wellington Times on 9th December 1915. The Statement of Service for Private Ashhurst in his service record shows his period of service was from 18th October 1915 until 9th January 1916. He is listed as ‘Deserter’ in the Remarks column. On 9th January 1916 Private Ashhurst of the Cooees Regiment or Corps was charged with desertion. A warrant was put out for his arrest on 16th February 1916. On 14th March 1916 Private Ashhurst was arrested at Cobar by the Civil Police. He was escorted back to the Liverpool Camp by the Military Police. The Western Age reported that ‘A Cobar resident named Loring Ashurst, who enlisted with the Coo-ees, was arrested by police on Tuesday as a military deserter, notwithstanding the fact that he holds his discharge from Liverpool camp, dated 9th December last, stating that he was medically unfit’, and that ‘The military authorities claim that the discharge is irregular’. Loring Ashhurst sent a letter to the Editor of the Western Age, in which he stated ‘Upon arriving at Liverpool camp and being brought before the proper officers it only required a little explanation on my part to prove to them that it was through no fault of mine that the discharge, which I possessed, was irregular, but the fault of a military acting Adjutant-General’, and that ‘I consider that I have been treated very shabbily, after having done my best’. Private Ashhurst was discharged services no longer required on 17th March 1916. NAA: A1, 1916/22239 Loring Centennial Ashhurst, Naturalization application, August 1916. Alex Halden (Joe) Miller, Gilgandra Coo-ee Recruitment March correspondence and papers, 1915-1939, letter from W. T. Hitchen to Mrs Asshurst, Cobar, 31 October 1915. Per his military service record (regimental no. 2208), Clement Patrick Kane was born at Cunamulla, Queensland. He gave his age as 21 years and 1 month, his marital status as single, and his occupation as labourer. His description on his certificate of medical examination was height 5 feet 7 ½ inches tall, weight 160 lbs., with a medium complexion, blue eyes, and brown hair. His religious denomination was Roman Catholic. He claimed that he had no previous military service. C. P. Cane was one of the thirteen men who ‘stepped forward and gave their names, either to march under Captain Nicholas, or to come after harvest’ after the recruiting meeting held to raise recruits for the Coo-ee March at Wongarbon on Thursday evening 14th October 1915. His Application to Enlist in the Australian Imperial Force paper was addressed to the Recruiting Officer at Wellington, and dated 16th October 1915, when the Coo-ees were in Wellington. He gave his postal address as Coolah, N.S.W. He completed his medical examination at Wellington on 16th October 1915, and was attested at Dripstone by Captain Nicholas on the 19th October 1915. After completing the march he went to Liverpool Camp and trained for the 15th reinforcements for the 1st Light Horse Regiment. On his embarkation roll his address at time of enrolment was P.O., Wellington, N.S.W. and his next of kin is listed as his sister, Mrs G. Guilford, at the same address. On 21st March 1916 Trooper Kane departed Sydney on the HMAT A26 Armadale. After arriving in Egypt, he was taken on strength of the 1st Light Horse Training Regiment on 24th April 1916 at Tel-el-Kebir. On the 15th of May 1916 he was transferred to the Artillery details. On 28th May 1916 Gunner Kane left Alexandria bound for England, on the HMT Corsican, arriving at Plymouth on 12th June 1916. On 9th August 1916 Gunner Kane was appointed a Driver. On 12th August he departed England, and on 13th August 1916 he was attached to the 4th Division Artillery details at Etaples, France. On 17th August 1916 Driver Kane was transferred to the 5th Division Ammunition Column, and he was taken on strength of this unit in the field on 21st August 1916, when it was in the vicinity of Erquinghem, France. On 30th December 1917 Driver Kane went on leave for two weeks to the United Kingdom. He rejoined his unit in France on 14th January 1918. On 17th June 1918 he reverted to Gunner at his own request. On 4th November 1918 He was transferred to the 14th Field Artillery Brigade. On 16th November 1918 he was re-appointed Driver. On 8th January 1919 Driver Kane went on leave to the United Kingdom until 22nd January 1919. He then rejoined his unit in France on 25th January 1919. Driver Kane commenced his return to Australia on 22nd May 1919, departing from Liverpool aboard the H.T. Durham. He was discharged at Sydney on 13th September 1919. Per his military service record (regimental no. 4446), Percy George Brown was born on 27th July 1894 at Westham, England. He gave his age as 21 years and 3 months, his marital status as single and his occupation as labourer. His description on his medical was height 5 feet 7 inches tall, weight 148 lbs., with a fair complexion, blue eyes, and brown hair. His religious denomination was Church of England. He claimed that he had 18 months previous military service in the 1st C. B. Kings Royal Rifles. He completed his medical on the 16th October 1915 at Wellington, and was attested by Captain Nicholas at Dripstone on the 19th October 1915. Percy George Brown was named as being one of the Wongarbon recruits in the Dubbo Liberal and Macquarie Advocate. Just before Private Brown embarked, it was reported in the Dubbo Liberal and Macquarie Advocate that he had written “The first batch of the Gilgandra “Coo-ees” to leave for the front will sail at the end of the present week. About 15 men, including four who enlisted at Dubbo, have been transferred into an earlier reinforcement of the same battalion, which the rest of the “Coo-ees” are in”. On 16th February 1916 Private Brown was one of this first group of Coo-ees to embark overseas, and departed Sydney on the HMAT Ballarat A70 as 14th reinforcement for the 13th Battalion, which arrived in Egypt on the 22nd March 1916. 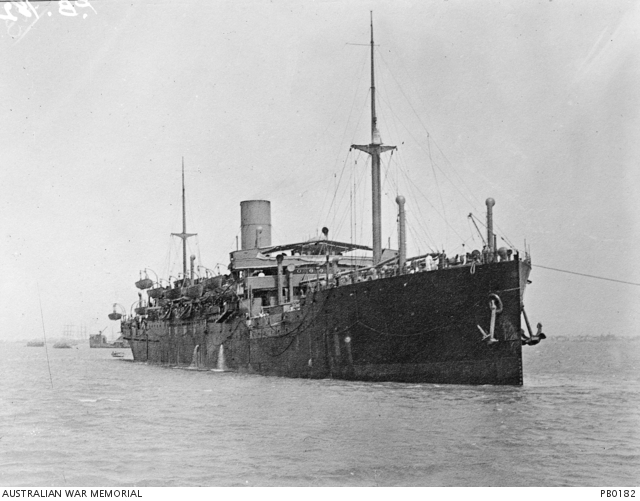 HMAT Ballarat A70, 18/2/1916. Photograph from the AWM Collection PB0182. On the 1st April 1916 he was transferred to the 54th Battalion at Ferry Post. On 3rd April 1916 he was admitted to the 1st Field Ambulance, then moved to the 2nd Casualty Clearance Station at Ismailia with defective vision. On 4th April 1916 he was admitted to the 1st Australian Stationary Hospital with Myopia. On 9th April 1916 he returned to his unit. On 2nd June 1916 he was admitted to the 1st Australian Stationary Hospital with defective vision. On 8th June he was transferred to the Training Battalion at Alexandria. On 6th August 1916 Private Brown left Alexandria aboard His Majesty’s Transport Megantic, bound for England. On 1st December 1916 he marched into the 4th Training Battalion at Codford. On 31st December 1916 he departed Folkestone aboard the transport Princess Henrietta for France. He marched into the 5th Australian Division Base Depot at Etaples on 1st January 1917. On 6th February 1917 Private Brown marched out of the Base Depot and on 8th February 1917. He was taken on strength of the 54th Battalion when it was manning the front line near Longueval France. On 24th February 1917 he was admitted to the 13th Australian Field Ambulance for eye treatment. He rejoined his Battalion on 25th February 1917. On 4th April 1917 Private Brown was sent to hospital sick. On 20th April 1917 he was admitted to the 11th Stationary Hospital at Rouen with Influenza. On 24th April 1917 he was sent to the 2nd Convalescent Depot. On 1st May 1917 he was transferred to the 11th Convalescent Depot. On 29th July 1917 he was transferred to the 5th Australian Division Base Depot at Le Harve. He rejoined the 54th Battalion on 18th August 1917 when it was refitting and training at Renescure, France. On 18th October 1917 Private Brown was admitted to the 8th Field Ambulance with debility. He was sent to the 5th Division Rest Station that same day. On the 30th of October 1917 he was sent to the 50th Casualty Clearing Station. On the 4th of November 1917 he was transferred to the 6th General Hospital at Rouen with Bronchitis. On the 8th of November 1917 he was transferred to the 2nd Convalescent Depot, then on 11th November 1917 he was sent to the 11th Convalescent Depot. On 30th January 1918 he marched into the 5th Division Base Depot at Le Harve. On 20th February 1918 he returned to the 54th Battalion when it was in the front line near Wijtschate, Belgium. On 26th February 1918 Private Brown went on leave to the United Kingdom. He returned to the Battalion on 15th March 1918 when it was in reserve near Dranoutre, Belgium. On 24th April 1918 Private Brown was with the 54th Battalion when it defending the vicinity of Villers Bretonneux, France. The Germans launched an attack on the Battalion which included the use of gas shells. The attack was repulsed with heavy casualties suffered by the Germans. The 54th Battalion suffered 3 men killed, 10 wounded, and 28 gassed. Private Brown was amongst those gassed. He was evacuated to the 14th Australian Field Ambulance then moved to the 61st Casualty Clearing Station. On 25th April he was sent to the 10th General Hospital at Rouen, then on 28th April to the 73rd General Hospital at Trouville, France. On 13th June 1918 he was transferred to the 1st Australian Convalescent Depot at Le Harve. On 3rd August 1918 he marched into the 5th Australian Division Base Depot. On 13th August 1918 he rejoined the 54th Battalion when it was at Fuilloy, France, preparing to move back into the line. On 27th September 1918 Private Brown was admitted to the 14th Australian Field Ambulance sick. On 28th September 1918 he was moved back to the 20th Casualty Clearing Station. On 29th September 1918 he was transferred to the 3rd Stationary Hospital at Rouen. On 30th September 1918 he was transferred to the 2nd Convalescent Depot. On 1st October 1918 he was moved to the 6th General Hospital. On 4th October 1918 he was evacuated to England, arriving at the 2nd Western General Hospital in Manchester on 5th October 1918. On 13th November 1918 he was transferred to the 3rd Auxiliary Hospital at Dartford. On 25th November 1918 he moved to the 2nd Convalescent Depot at Weymouth. On 9th December 1918 Private Brown departed England for return to Australia aboard HT Argyllshire. He arrived in Australia on 14th February 1919, and was discharged on 10th October 1919. Private Brown’s return to Australia was reported as follows in The Dubbo Liberal and Macquarie Advocate: “Recently returned from the front, after three years of active service, Private P. G. Brown. He joined up with “The Coo-ees” at Wongarbon early in October, 1915. He has seen service in Egypt and France, and was wounded and gassed. His many friends in Wongarbon and district will be pleased to hear of his safe return”.